Be the first to share your favorite memory, photo or story of Boniface "Butch". This memorial page is dedicated for family, friends and future generations to celebrate the life of their loved one. Age 71 of Lennon passed away Sunday, October 28, 2018 at his home. A Mass of Christian burial will be held 10am Friday, November 2, 2018 at St. Joseph Catholic Church Owosso, Michigan with Fr. Michael O'Brien officiating. Burial will follow at St. Paul Cemetery. The family will receive friends at Nelson-House Funeral Homes, Owosso Chapel on Wednesday from 6pm to 8pm and Thursday from 2pm to 8pm with a rosary prayed at 7pm. Butch was born April 7, 1947 in Owosso, the son of Eugene and Ella (Minarik) Beckman. 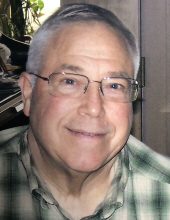 He graduated from Corunna High School, class of 1965 and spent several years in Hastings, Nebraska at Crosier Priory Immaculate Conception Monastery. While in Nebraska he found his niche in the electrical field and eventually made his way back home where he would meet the love of his life. Butch married Josephine "Josie" Osika at St. Joseph Catholic Church on September 25, 1971; she predeceased him on February 8, 2007. He was a member of St. Joseph Catholic Church where he was very active and passionate with his Catholic faith. Butch was a true farmer at heart and a member of the Toy Tractor Club. He never quite grew out of collecting John Deere tractors and memorabilia. Butch had an abundance of love and joy for his family and touched numerous peoples lives with his kind heart and wealth of knowledge. Most of all Butch looked forward to the serenity of vacationing at the family cabin on Higgins Lake. He retired from General Motors-Buick in 2004 as pre-production show car supervisor after 33 years of service. He was blessed to make a career out of cars, a favorite hobby for him and worked with wonderful people that became his life long friends. Butch is survived by his children Katrina (Chris) Hacker, Dominik (Liz) Beckman and Rachelle Beckman (Bob Miller); grandchildren Gracie and Amelia Beckman and William Miller; brothers-in-law Francis Osika Jr. and Philip Osika; sisters-in-law Christine Osika and Pam (Dan) Butcher; many special aunts, uncles, nieces, nephews, great nieces and nephews and other loving family members and friends. He was predeceased by his wife Josie, infant daughter Marcella, parents, brother Eugene "Bud" Beckman and infant sister Margaret Beckman. Memorial contributions are suggested to the Crosier Community. To send flowers or a remembrance gift to the family of Boniface "Butch" Eugene Beckman, please visit our Tribute Store. "Email Address" would like to share the life celebration of Boniface "Butch" Eugene Beckman. Click on the "link" to go to share a favorite memory or leave a condolence message for the family.